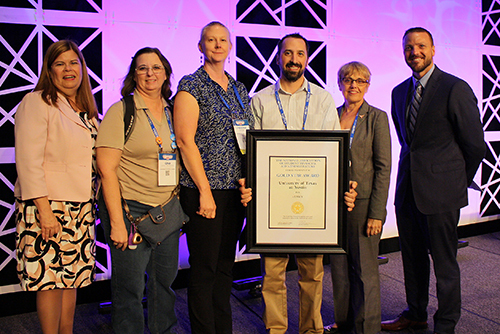 NASFAA's Gold Star Award recognizes innovative ideas in the financial aid arena at any level, targeted toward any constituency. 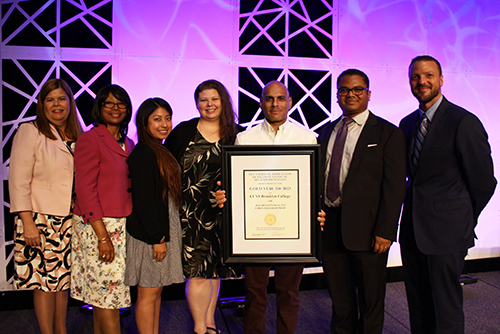 This award is open to individuals working at NASFAA member institutions; member institutions; regional associations; and state associations. The Gold Star Award honors up to three ideas each year. Project Objective: The project was developed to modernize the application portion of the process and allow students the ability to electronically report financial data through a self-serve web solution. Executive Summary: The eTASFA application is a web-based document for special residency students at the University of Texas at Austin, enabling them to complete their state financial aid application online. The application uses DocuSign for electronic signing. In additional to serving students, the application also reduces manual data entry by the Office of Financial Aid staff. Staff in the Office of Financial Aid created the application, along with input from students. eTASFA went into production in October 2017 after 18 months of development. As of February 2018, approximately 160 students have used it, saving 20 hours per week of staff time. Project Objective: To better serve the financial aid needs of the students of CUNY Brooklyn College, the Financial Aid Office implemented a cohort advisement model to help our predominantly low/middle income, diverse and in many cases, first generation families to navigate what can at times be a complicated financial aid application process. Executive Summary: For the 2016-17 academic year, the Office of Financial Aid at CUNY Brooklyn College moved to a cohort advisement and application processing model. This allowed us to assign every single financial aid applicant a dedicated financial aid counselor to assist them with the often-complicated application, awarding and disbursement processes. In the 2015-16 academic year that immediately preceded the implementation of our cohort financial aid advisement model, only 54% received some form of financial aid. In 2016-17 under the cohort model, 76% of the student population received some form of financial aid. This is a direct success of the cohort advisement model. Additionally, aid disbursement totals for 2016-17 show an overall increase in total aid and a reduction of loans borrowed. We believe that increase in overall aid and grants and a reduction in student loan borrowing directly coincide with our implementation of the financial aid cohort advisement model, students are more informed from a financial literacy perspective regarding loans and maximize their federal and state grant eligibility.